Many families know how difficult it is to find treatment for their relatives with mental illness who also abuse drugs and or alcohol. Programs that treat people with mental illness usually do not treat substance abusers, and programs for substance abusers are not geared for people with mental illness. Individuals with both diagnoses often bounce from one program to another, or are refused treatment by single-diagnosed programs. The presence of both disorders must first be established by careful assessment. This may be difficult because the symptoms of one disorder can mimic the symptoms of the other. Once a diagnosis of D/D has been confirmed, mental health professionals and family members should work together on strategies for integrating care and motivating the client. What Kind of Treatment Works? People with such difficult problems do not respond to simplistic advice like “just say no” or “snap out of it”. Psychotherapy, medication and electro-convulsive therapy combined with appropriate self-help and other support groups help the most, but these patients are still highly prone to relapse. Treatment programs designed only for substance abusers are not recommended for people who also have a mental illness. Heavy confrontation, intense emotional jolting and discouragement of use of appropriate medication tend to compound the problems of mentally ill patients. These strategies may produce stress levels that make symptoms worse or cause relapse. Increasingly, the psychiatric and drug counseling communities agree that both disorders must be treated at the same time. Early studies show that when mental illness and substance abuse are treated together, suicide attempts and psychotic episodes are less frequent. Since D/D patients do not fit well into most 12-step groups, special peer groups based on 12 step principals should be developed. Clients who develop positive social networking have a much better chance of controlling their illnesses. Healthy recreational activities and peer relationships are extremely important. Mental health and addiction counselors increasingly believe that mental illness and substance abuse are biologically and physiologically based. Families may feel angry with the person and blame him for being foolish and weak-willed. They may feel hurt when the person breaks trusts by lying and stealing. It’s important for them to realize that mental illness and substance abuse are diseases and that the person cannot take control of without help. How D/D Affects Families and Friends? Dual diagnosis means the condition is especially complex and difficult to manage. Families with a dually diagnosed member may experience twice the problems of those whose family member has only one disorder. The combination of mental illness and substance abuse is so common that many clinicians that work with the mentally ill now expect to find it. 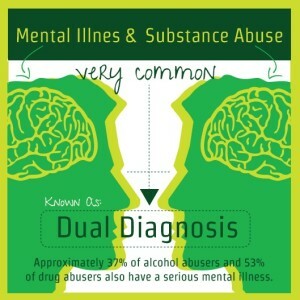 Studies show that fully 50% of persons with mental illness also have a substance abuse problem. 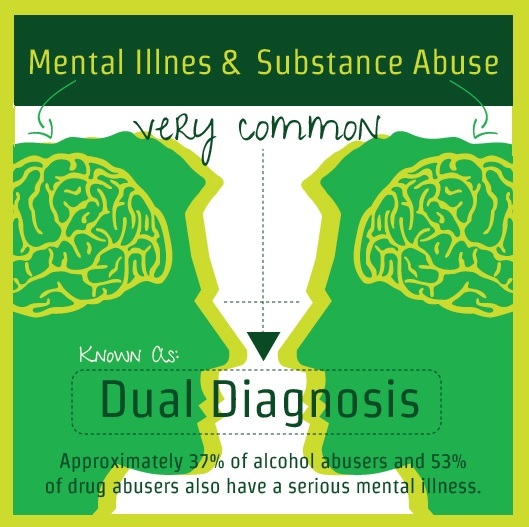 More than half of the people with a substance abuse diagnosis also have a diagnosable mental illness. What Do Model Programs for Treating Mental Illness and Substance Abuse Look Like? There are a growing number of model programs. All of them have support groups similar to AA and NA. Members support each other as they learn about the role of alcohol and drugs in their lives. They learn social skills and how to replace substance use with new thoughts and behaviors. They get help with concrete situations that arise because of mental illness. Several programs have support groups for family members and friends. The New Hampshire Mental Health and Substance Abuse Departments sponsor a program with the Dartmouth Medical School Psychiatric Research Center for the State’s 10 mental health service regions. Teams of professionals provide case management services. A New York program operates in a wide range of service settings. Treatment focuses on eliminating symptoms and developing strategies to prevent relapse. A residential rehabilitation program in a high crime and drug use area of The Bronx helps 45 homeless people who are both drug abusers and have a major mental illness. In Washington DC, a program offers case management in integrated and referral to substance abuse service in the community.